The Broil King Keg 5000 features 480 square inches total cooking space, including a chrome coated secondary rack, a heavy-duty cast iron cooking grid, a durable steel base and metallic charcoal paint finish. The upper damper is made of heavy duty cast iron and allows you to control the temperature of the cookbox with top-air flow. The multi-tool allows you to open and close the damper with ease, allowing you to cook low and slow or hot and fast. The exterior is a durable powder coated finish that is easy to clean and designed to last in all weather conditions. When you open the lid, you will notice a high performance lid seal designed to keep the heat from escaping between the lid and body. Fully adjustable dampers are made of heavy duty cast aluminium. It allows precise cooking by controlling the air flow throughout the cooking chambers. The Keg 5000 also comes with a removable, slide-out ash container for quick and easy clean up. Best Grill I have ever owned! I have had mine since 2010 and use it weekly. It does a great job on steaks, ribs, burgers and dogs, and pork tenderloin. And for the last 6 years I have cooked our Thanksgiving Turkey on it and everyone loves the smokey flavor. I have also taken it to hunt camp on the back of my truck. Just a great all around grill that makes it fun to grill. I bought my grill before it became the Broil King Keg and it has been great for many years of varied use. I've slow smoked full pork legs for 28-29 hours, seared steaks at over 900F and everything in between. This 'Q' can do it all. Temperature control is straight forward after a couple of runs to get the hang of it and it will go a long time without the need to add charcoal (I didn't add any after a large load to start before cooking over 24 hours, didn't need to open the Keg to add more). The insulation in the body is incredible, it is extremely efficient and doesn't lose much heat through the body at all. I've taken it to the cottage & grilled with it on the bow of a patio boat at a water access only beach. Dropped it on the hitch mount to cook up incredible camping meals. Even walked it down the road to join another Broil King grill in cooking up a storm. The portability and versatility is unmatched! If you're on the fence, jump on over, this thing is amazing! Worth every penny, makes the most delicious foods. Retains perfect amount of heat while the outside is cool to the touch. I have the hitch attachment, so I can take it anywhere and BBQ up anything I like. Such a great BBQ, I also have the Signet, I'm not the best cook, but I haven't managed to screw up anything on it, despite my best efforts everything comes out perfect. It was a fathers day 2015 gift... I use it year round for grilling, slow cooking and even some smoking... does just as amazing a job at -20 as it does in summer. I could not recommend this grill more! I love it! I just purchased the Broil King Keg 5000 a few days ago and so far... I cannot say enough good about this BBQ. Initially, I was tentative about purchasing a Ceramic Kamado "knock-off"...as is a steel version of the long standing ceramic Green Egg. Right out of the box I was and am impressed with the Broil King 5000. Assembly was approx. 30 minutes after unpacking all of the parts and reading the very good instructions. The assembly was all about attaching 3- handles, lifting BBQ into stand, locking in place with locating pin and clip... 4 screws to attach utensil hooks to side shelves... attaching side shelves using quick connection pins... Assembly does not get easier and i have had the experience of expending two plus evenings on assembly of other grills in my past. Quality is very good! All parts fit together easily and everything (body, cast iron dampers, main grill, stainless steel warming grill, side shelves, nest/stand) "feels like quality" on this grill. Benefits/Features: Keg 5000 comes with cast iron main grill that includes a cast iron insert that is easily removed for addition of charcoal/wood chips if required. A "Warming" rack that inserts into the main grill via a "post" for easy removal or rotating to the side for fuel replenishment. (At this point in my experience, this warming grill is excellent for smoking.) The shell/main body is painted steel with very high quality. It is constructed of double walled steel construction with insulation inside and remains cool/warm to the touch even after several hours of grilling at moderate temps. A very huge bonus for me is that after grilling, I can place the cover on the BBQ without fear of melting the material. So, no need to remember to cover before continuing on with your night of entertainment. closing down the grill consists of closing top and bottom air dampers and placing cover on the grill. The Ash Drawer is an added bonus for emptying the grill after several uses... simply pull out the drawer and deposit ashes in compost bin or wherever desired. My first cooking experience started in the dark with the charcoal started in a Chimney and added to the Keg along with some water soaked wood chips. I placed pork ribs on the main grill and attempted to learn how to control the heat with my new unit. Heat control was easy I thought as I kept a close eye on the thermometer and made slight adjustments to the upper and lower dampers to obtain optimal temperatures. First time out, I had no problem maintaining 275-300 cooking temperatures. In approx. 3 hours, I removed the ribs and we enjoyed the BEST TASTING ribs I have cooked in 15 years of smoking ribs on far less superior grills. (BTW... in the past, I have had compliments on my ribs... I can't wait to treat these same people to even better tasting...mmmm). My second cooking experience involved smoking trout fillets and some beef rib strips... MMM... MMM...mmmmmmmm! No disappointment here. My third cooking (tonight)... upon starting grill I found I still had enough charcoal and wood chips left from my first cook to smoke more ribs. = very economical in fuel compared to my last BBQ grill that was "high end" but of a lot less quality than the Keg 5000 I have owned this grill less than a week ... so far this has been an excellent purchase that I wished I had made a few years ago. I will update my review to either confirm my satisfaction or inform on any issues. Although, I really am not expecting any serious issues worth writing about... smiles. Warranty Registration On-line did not go well as the website apparently thought I had purchased a gas grill... notta! I called customer support and had to wait approx. 10 minutes for a customer service agent to register my grill via telephone. small inconvenience as I am used to on-line service vs. waiting on the telephone for help. however, once my call was answered, service was excellent. For those that are wondering what Kamado grill to purchase... 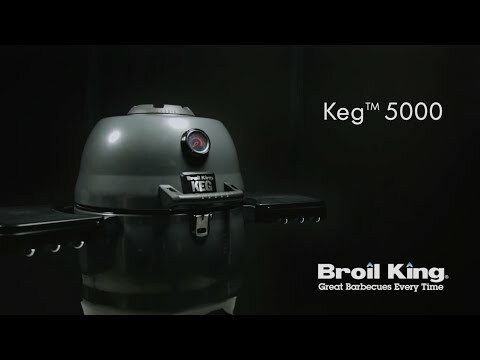 I highly recommend the Broil King Keg 5000! Sold my .... once i tried one of these. Better features, durability, and performance than any ceramic. Originally bought the bubba keg from retail store many years ago. Was extremely happy but sold it to my brother to buy a ceramic kamado. Big mistake! Found a used bubba keg at a online garage sale, bought it and am happy again. I will definitely buy a new broil king keg if this one ever wears out. Exceptional heat retention, fire control, reuse the lump charcoal, the most efficient smoker/grill there is. Bought this bbq delight a couple months ago and its performed fantastic. Temperature is easy to control for a relative newbie to charcoal grilling like me and is super efficient. Living in a cold weather climate I was looking for a durable charcoal grill that was easy to maintain and this machine does the trick! I bought this item a little over a month ago. Grilling meats is amazing. I recently smoked some wings and this weekend I am doing ribs. The cooker holds a temp for hours, you just have to play with it a little to dial it in, overall very very high quality and much more durable than traditional ceramic kamodo cookers.